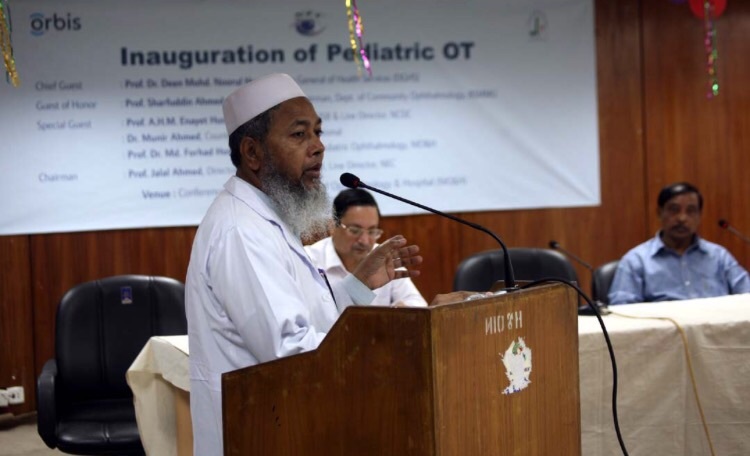 Bangladesh’s first international-standard specialised paediatric operation theatre (OT) at the national level has been launched at the National Institute of Ophthalmology & Hospital (NIO&H) at Agargaon in Dhaka. Director of NIO&H and Line Director of National Eye Care Prof Jalal Ahmed inaugurated the OT on Wednesday morning. Country Director of Orbis International Dr Munir Ahmed and Head of the Paediatric Ophthalmology Department at NIO&H Md Forhad Hossain were present as the special guests. Physicians, officials, teachers and students of NIO&H were also present. NIO&H and Orbis, which is sponsoring the OT unit, believe it will be milestone in paediatric eye care in Bangladesh. They say children will be given world-class services at the unit for free. Speaking on the occasion, Prof Jalal Ahmed and Dr Munir Ahmed urged all concerned to work sincerely for ensuring the best utilisation of the operation unit. Dr Munir said equipments and services at NIO&H have improved a lot and expressed his hope that they would improve further in the days to come. Highlighting the services that Orbis offers, he said the international NGO not only provides equipments, it also shows how high quality services can be ensured. He also hoped NIO&H would be strengthened further as the apex institution in eye care.